As part of the demo sneak, we are able to see some of the hostess level 2 and level 3 sets. I’m still deciding which ones to order, but while my mom was visiting, she brought her level 3 set called Dream a Little. It has a two step stamping flower head, two other long stem flowers, a hummingbird, a leafy stem, and the sentiment. 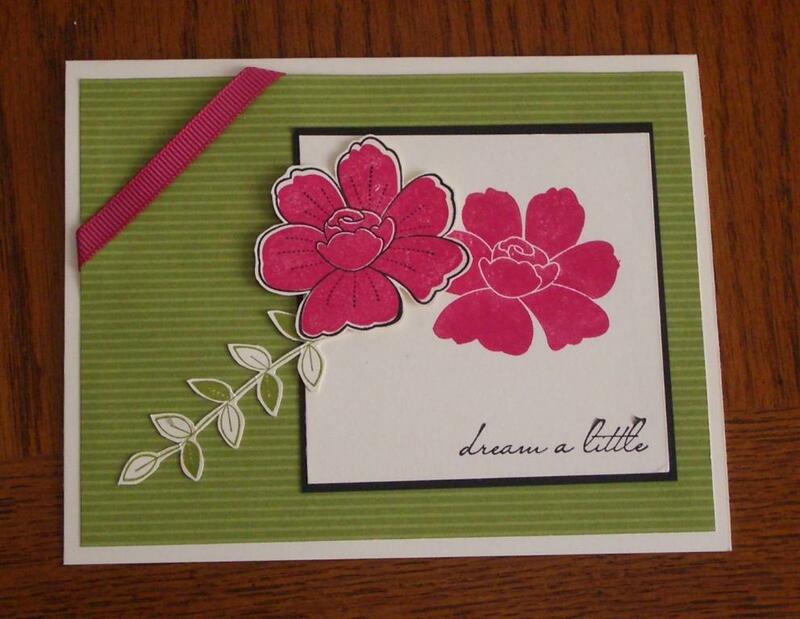 I love the stem and the flower heads from this set, and so I started combining them and came up with this card. I’m always looking for ways to use my stamps in different ways. Sure I love making cards, but sometimes you need something different and its fun to use your stamping supplies to add that personal touch. In this case, my sister-in-law’s birthday is 2 days before Christmas. So, when I bought her a gift at the local soap store, they offered to decorate the box as a gift. 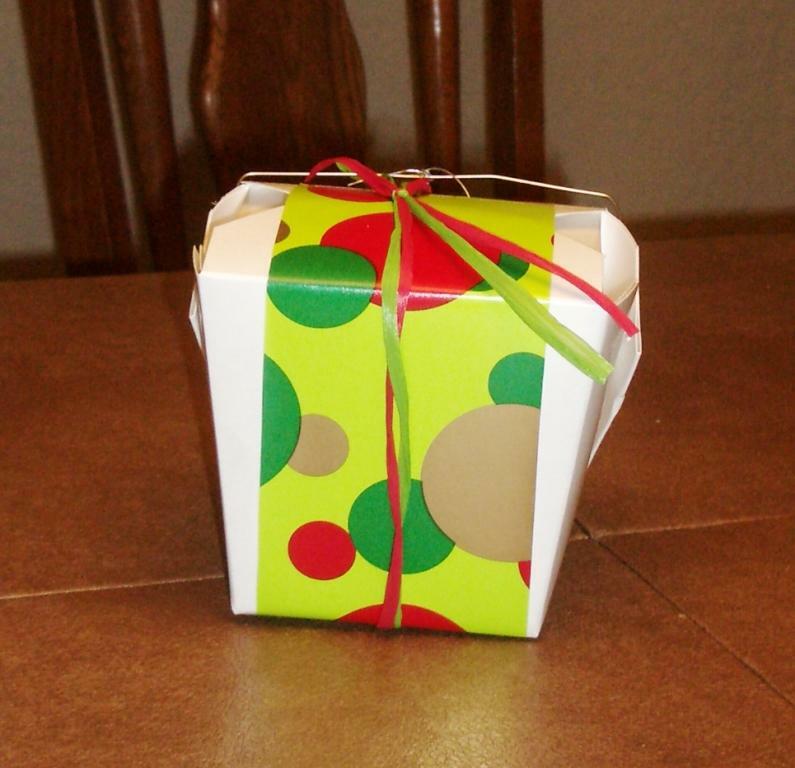 I couldn’t turn down free gift wrapping but after they gave me the wrapped gift, I realized it was really Christmas wrapped. My birthday is a week before Christmas, so I’m pretty sensitive to differentiating birthday and Christmas gifts, so I wanted to make sure her gift was definately “birthday” and not “christmas”. So, stamps to the rescue! 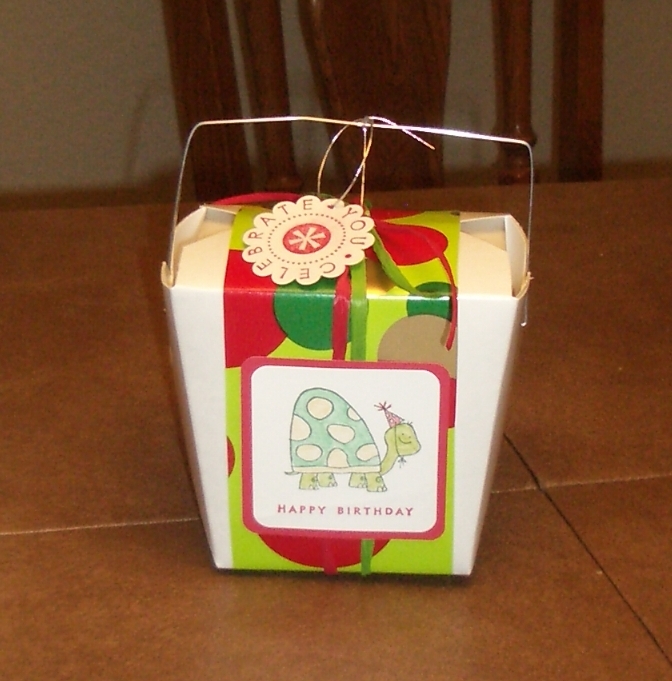 The turtle is from a hostess set from the last catalog, but the tag is from the new Party Hearty set and the Happy Birthday under the turtle is from A Little Birthday Cheer. This was also my first time in a long time using water color pencils. They are like magic! 🙂 If you haven’t used them before, you color in an image with the pencils and it looks like normal pencil. But then, go over the colors with a water pen and suddenly the color blends and instead of pencil marks, you just have a smooth watercolor image. I’ve been so caught up in the new Love You Much bundle special and the new catalog sneak peeks that I completely forgot that there is still a few days to get 20% off some of the current stamp sets in the Fall/Winter Idea book & Catalog! So, just in case you were like me and you had been thinking about getting one of the stamp sets below, you have 4 days left to get them at 20% off! You can contact me or order directly online for this great deal. Each year, I trade scrapbook pages as Christmas gifts with family members. The pages highlight what my family did over the last year, so in the end, I have a stack of pages showing me what everyone has been up to while I’ve been living out of state. It is lots of fun to do, but this year I had so many things to share that I needed to make 4 pages for each gift. I was trading with 4 families this year, so that was 16 pages to make. It may not seem like a lot, but doing 16 12×12 pages in 2 days (I’m a late starter) was a lot of work. However, it was fun to get some scrapbooking in. I’ve spent so much time recently doing cards and 3D projects, that I’m a bit rusty on scrapbooking (I was suprised at how different a style it can be). This time, I was able to start incorporating stamping into my scrapbooking with the Enjoy the moment stamp set on my pink pages. And of course, I couldn’t live with out my punches (corner rounder and ticket punch) whether I’m making cards or scrapbook pages. So, I’ve seen a lot of folks make different paper purses/gift bags/bag in a box/etc and I’ve dabbled a little in making these projects but only a little. With my mom here for the holidays, she brought lots of project designs and creative motivation. So I decided to try something new. 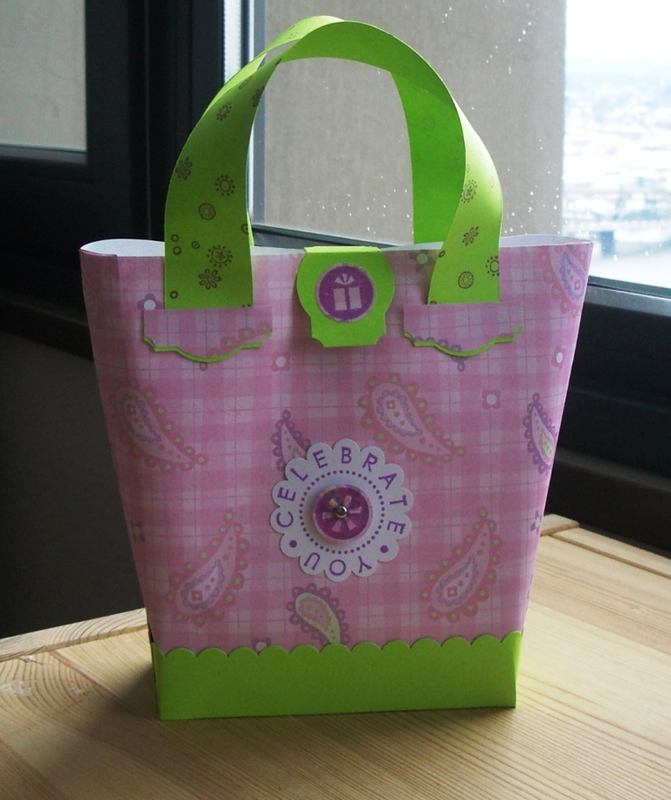 These purses are really cute in person and actually really easy to make. Love You Much sample and Sneak Peek Promotion! For some reason I had my dates wrong with the sneak peek promotion and didn’t realize it started today! Oops! Well, now I know better and wanted to share with you all the details and a sample I made. So… want to see some new stuff from the upcoming Spring/Summer idea book? Of course you do! Well, it looks like some new punches, paper, brads, and stamp sets are in your future! 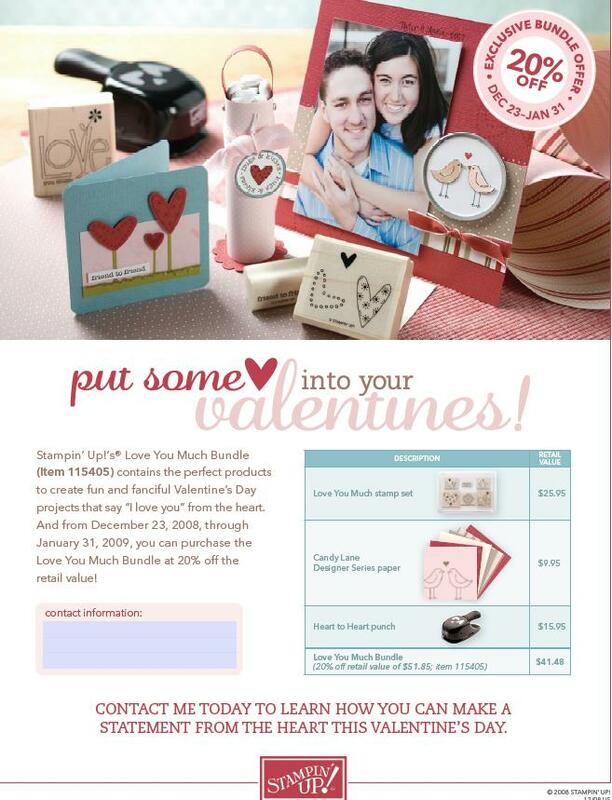 This year Stampin’ Up is letting non-demonstrators get some sneak peek items before you can buy them from the regular catalog with the Love You Much bundle. In this bundle, you get a brand spankin’ new stamp set, a hot off the presses set of Designer Paper, and the fantastic heart trio punch that is a perfect match for the stamp set! And not only do you get the early preview of the products, but you get a 20% off discount! Seriously! This bundle is available until Jan 31st, but if you order today you can combine it with the free shipping and 10% off retiring set promotion for tons of savings. 🙂 (I’m a bargin shopper so this type of compounded sale is the sort of thing I live for). If you don’t see the bundle available online, just email or call me to place your order. Here is a quick sample I made up. 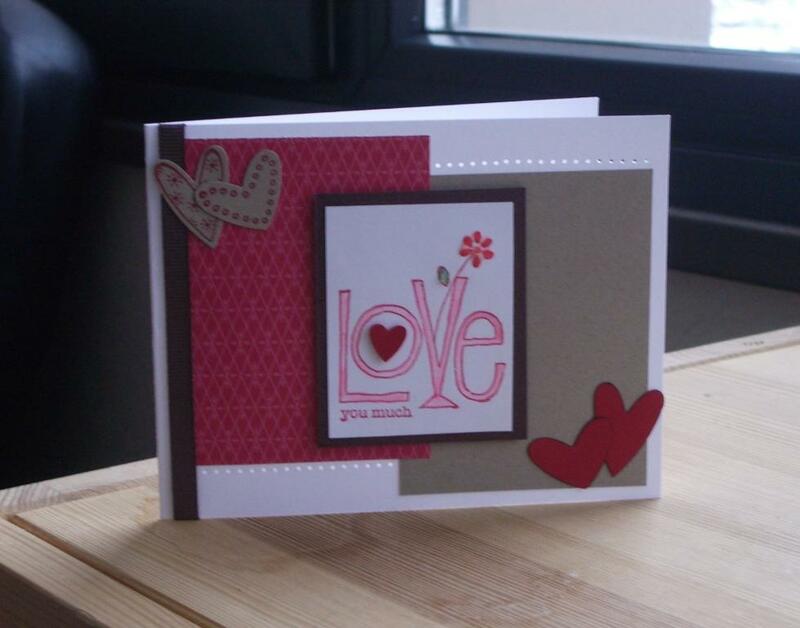 I love using the heart trio stamp set with the punch! Too much fun (you can see them both in the image from the flyer). So, I just wanted to remind everyone – today is the last day to get 10% off any retiring stamp set and to receive free shipping on orders totally $70 or more! If you have been debating a set, now is the time to order to get the most for your money. You can email me or shop online via my website to take advantage of this great special.